Allex Ferreira’s career as a freelance photographer in Sao Paulo Brazil started with a one year trip around the world in 2008, and a yearning to take photos. PHOTOGRILL: Can you tell us about your photography in general? PHOTOGRAPHER: For me to answer this question, I should talk about the past and how I started in the industry. 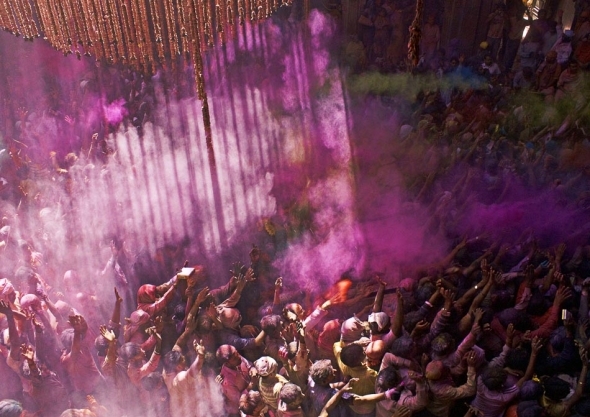 I began photography in 2008 during an extended trip around the world. I purchased a good camera prior to leaving and started to shoot everything; from dogs to people without any particular objective. With time, landscapes formed a large part of my shooting while I was travelling, but as I started to notice the cultural diversity, colour of skin and different faces, I started to lean towards portraits. It became my fascination; I simply loved photographing people. After I arrived back in Brazil I spent a year sending my work to magazines and newspapers, whilst also working on a book about my trip and how I discovered photography. All that time and work I put in last year is paying off now. I work as a freelancer for a Sunday Magazine for the biggest newspaper in Sao Paulo doing studio work. PHOTOGRILL: Why did you take the Holy Festival photo? PHOTOGRAPHER: After experiencing the Desert Festival in India, many people told me that I shouldn’t miss the Holy Festival. The Desert Festival in Jaisamer was amazing, the people, the colours and the way they dressed; it was just unbelievable to watch. I think that festivals such as those in India are a photographer’s paradise, and for a portrait photographer like me, it was just something special. I was in heaven. I heard the Holy Festival in Mathurait (near Delhi) should be way better and it was. It was like candy for my eyes. Such a unique life experience, one I was lucky enough to be there to document. It was an emotional experience also as it marked the last day of my trip. PHOTOGRILL: What was it like to be there? PHOTOGRAPHER: It’s hard to describe the experience in words; something that is so unique visually. But I can tell you that when you are there you are very much a part of the festival. There are people throwing coloured water and coloured powder everywhere. Within 30 minutes your entire body is covered with every colour of the spectrum. It’s a male dominated event, and women are rarely seen. As you enter into the main temple you immediately notice such a high level of devotion. Coming from a religious country myself I thought I had seen such faith, but India seems to take it to another level. carry, how did you interact with people? PHOTOGRILL: How do you think as a photographer shooting an event like this? PHOTOGRAPHER: Since I started in photography I always employed the same technique, I create the picture in my head and then I take the shot. I always photograph in natural light. At the time I wasn’t even thinking I should have better equipment. I just wanted to take a nice shot. I always have the picture created in my head before taking the shot. I believe this is the best tactic for a nice shot. It’s like a musician creating a song. For me it is the same thing. But I still take the shots as they come. If I plan too much I believe it takes away from the creativity that must exist while taking pictures. PHOTOGRILL: Why did you make this picture from above? PHOTOGRAPHER: That day, there were about five photographers, including myself on the ground floor of the temple. But on the top of the temple in an ideal position was a television crew shooting live. I went upstairs and I spoke to the guards and I insisted that he let me shoot from there. After a few minutes of persuasion they let me stay in the balcony with the TV crew for a few incredible and unforgettable moments. I could see the temple and the mass of people and culture below as I stood from above in my privileged position. Suddenly people start to look up at me, probably because I was not Indian. In a second, without thinking I shouted to my audience “HARE KRISHINA”, to which they shouted back “HARE HARE!” The eco sound bouncing on the wall, Man THAT was a feeling. From that point on I started to photograph everything from above. PHOTOGRILL: What were the technical details, exposure etc? PHOTOGRAPHER: I don’t think too much about f-stop or exposure, tripods and so on. The benefit of working with a digital camera is that you can look and see the result straight away. I believe the old photographers had to keep all that in mind, because they didn’t have the luxury of making a mistake. As I shoot portraits I am always thinking of the person’s face rather than anything else. I believe when I get older I will be thinking more about all this but now I don’t bother with it. This entry was posted on Sunday, April 17th, 2011 at 9:10 pm. It is filed under The Grill and tagged with People, Photojournalism. You can follow any responses to this entry through the RSS 2.0 feed. A moment of time frozen by the photographer is “PRICELESS”!! Top work Allex, keep it up!